Give your eyes a break so you can focus on the finishing touches. The XtraFlex LED Craft Light is breathtakingly bright and also happens to be one of our lightest, most compact models. Affordably priced and travel-size, it’s ideal for those who take their projects out and about. Clip it to just about any surface or hoop (including the popular Q-Snap) or use it freestanding on a level surface. You have full control over the flexible neck to direct the single LED and illuminate quilting, embroidery, or a host of other projects. In a pinch, you can even shine it like a flashlight into those dark corners where pins love to get lost. An exceptional value. The Mighty Bright XtraFlex is a great all-purpose booklight, providing 10 lumens of brightness with a battery life of 72 hours. Powered by (3) AAA batteries or by AC adapter (sold separately), with no need to remove the batteries when using the adapter - it's designed to be versatile! Manufacturer SKU# 40460. Lightweight, portable, and multi-purpose - not just for books! 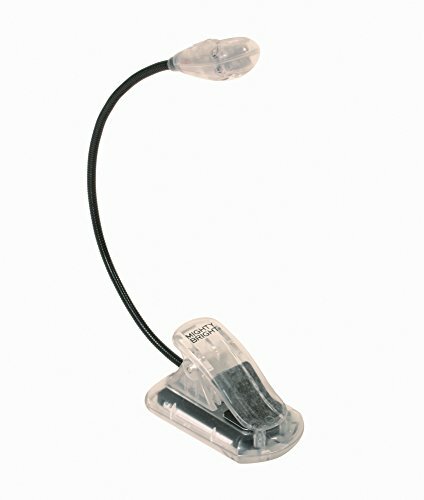 It can be used free-standing on its wide base and the secure padded clamp opens to 1.5", making the XtraFlex perfect for camping, kids' reading, studying, on music stands, as an automotive repair light, a computer light, for tasks, crafts & hobbies, travel, and for reading in bed without disturbing your partner.